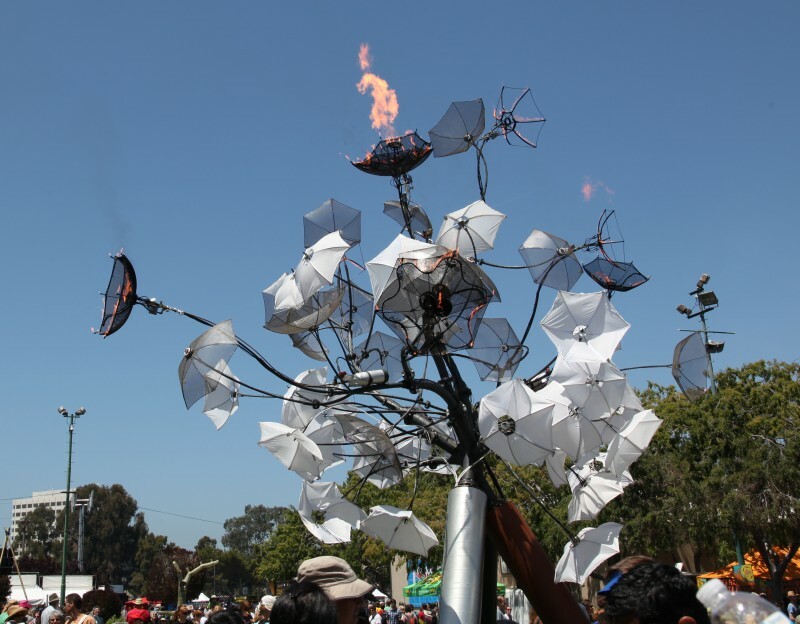 We took a trip up to San Francisco for the Maker Faire 2012. 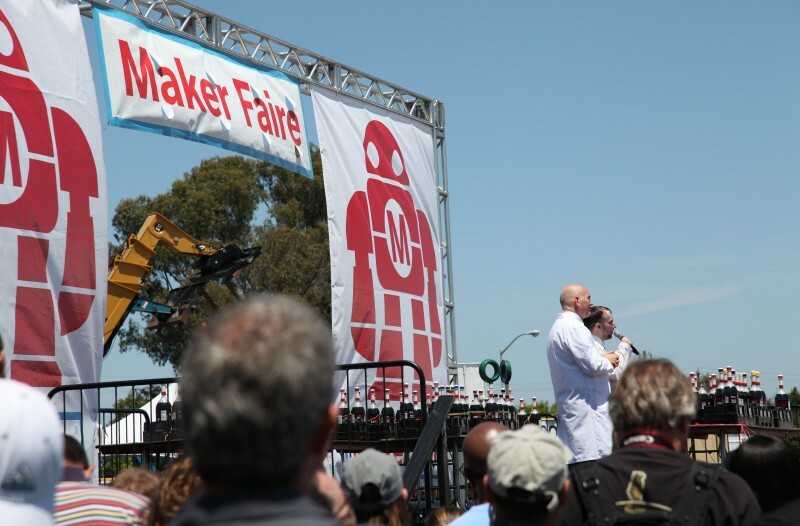 It was so crowded, it was hard to enjoy the hands-on exhibits. The Mentos and Coke guys were there, though. They drop Mentos into Diet-Coke and it explodes into huge gushers of soda. It's pretty awesome. Why Mentos? It's not a chemical reaction, you can drop anything into a soda and some of the carbon-dioxide will bond to it and start to foam up. If there's a lot of little places for the carbon-dioxide to grab, it will explode out of the bottle, and Mentos work great for that. Why Diet-Coke? Because it doesn't have sugar so once you're covered in soda it won't be sticky. 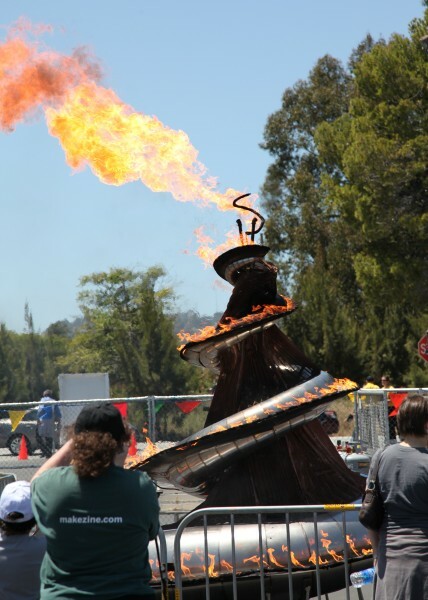 This was a fire sculpture at the Maker Faire. There was a lot of fire around, they even had a fire-breathing dragon that you could crawl inside of. This exhibit had fire up top, and misting umbrellas below. 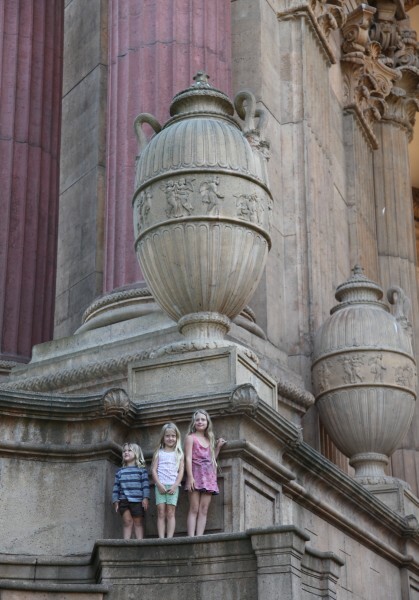 While up in San Francisco we went to the Exploratorium, which was totally awesome. Tons of exhibits and all of them interactive. 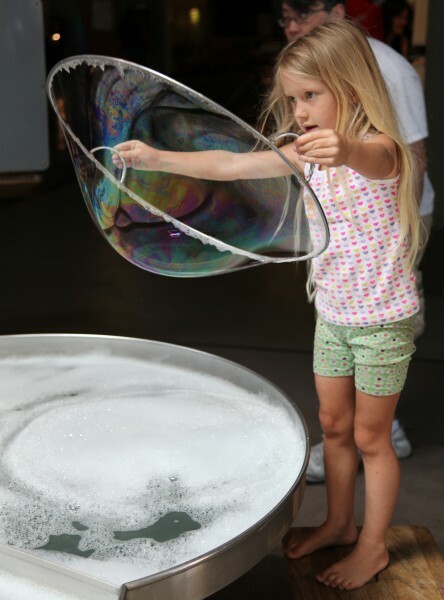 Here's a bubble exihibit, which of course the kids loved. Who doesn't love bubbles? At the Exploratorium they have this magnetic fluid exhibit that's pretty wild. Mia is moving a magnetic underneath the fluid making and it's trippy to watch. 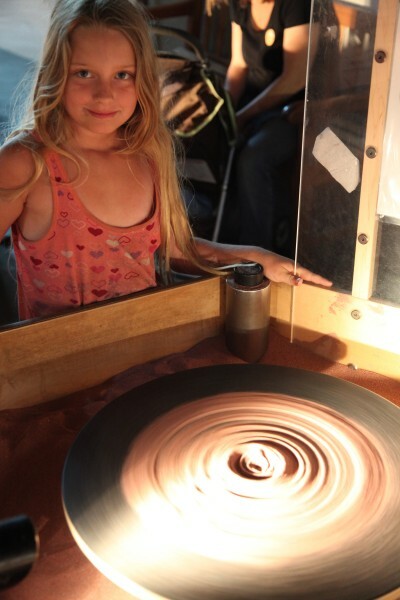 You can make patterns in the sand on this spinning disk at the Exploratorium. All the kids took turns making bubbles, it was by-far the most popular thing to do. The funny thing is how easy an exhibit it is to do at home. 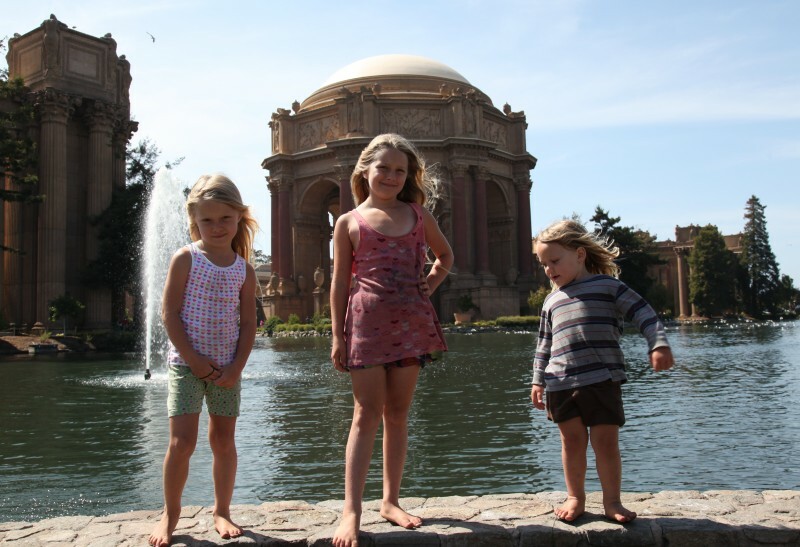 The Exploratorium is located in the Palace of the Fine Arts. They have these gigantic buildings there around a lake, it's a really fun place to run around at. This gives you a sense of the scale of the place, it's huge. 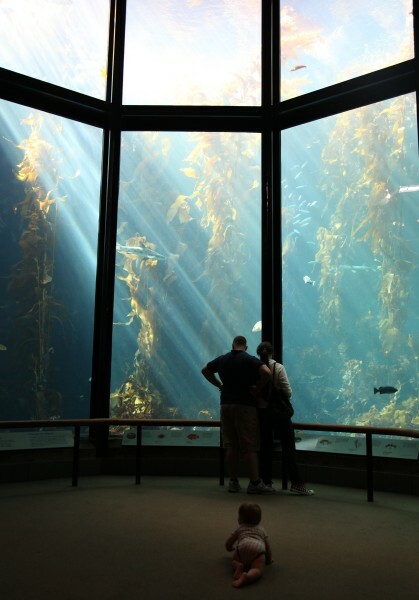 After the Maker Faire, the next day we drove over to the Monterey Bay Aquarium. It was really big and right now they have a very cool jellyfish exhibit. 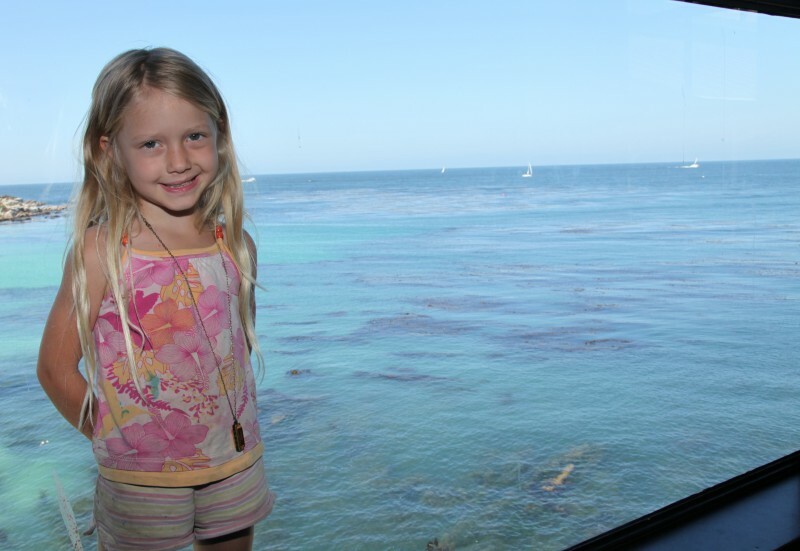 Mia visiting the aquarium. She picked up the harmonica necklace she's wearing at the Maker Faire. It really works, too. 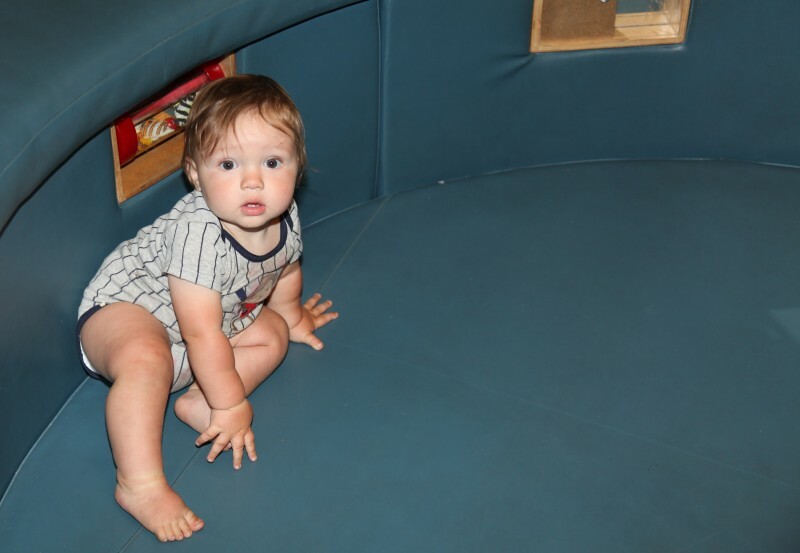 The kid area at the aquarium was very kid friendly, including this padded enclosed area to let Miles crawl around all he wants. Nearby the aquarium is Dennis the Menace park. 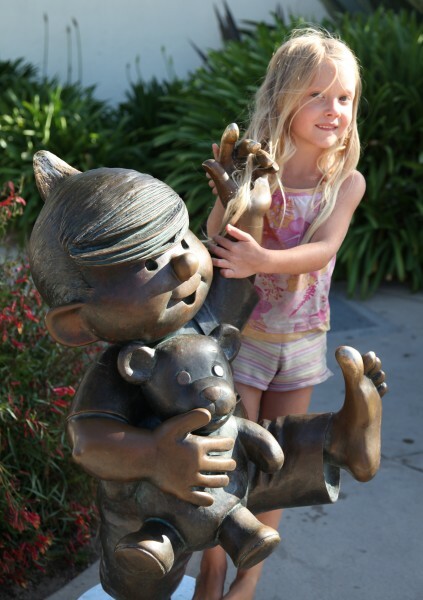 Hank Ketcham, who wrote Dennis the Menace, designed the park. It's actually a really great park. 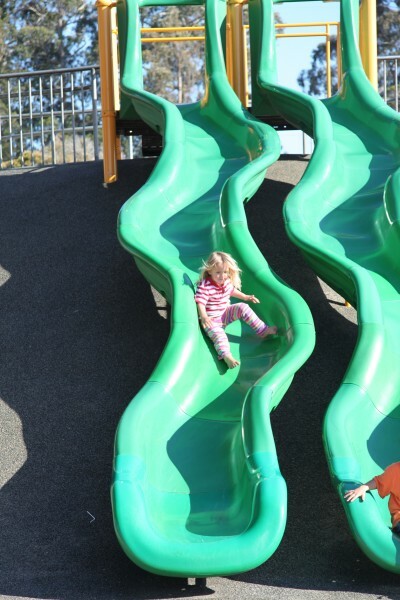 The kids, especially Desmond, were sliding down this slide over and over. This is a huge bridge at the park. 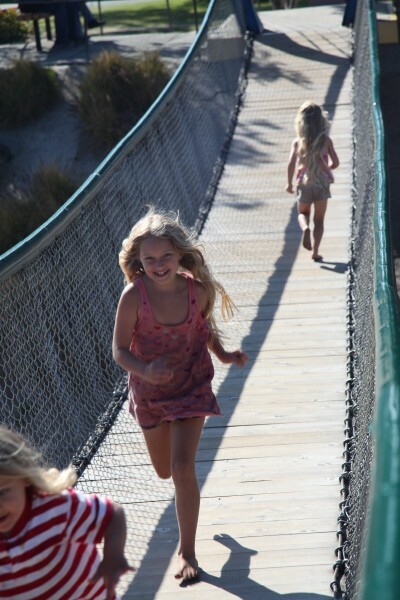 It's amazing how much fun little things can be, like running across a bridge as fast as you can, over and over again. 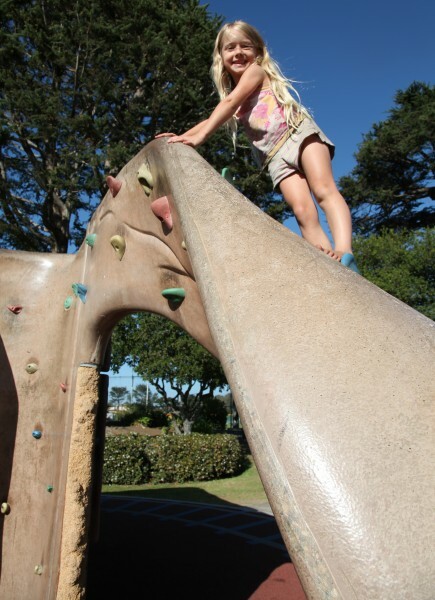 They had a cool climbing wall at the park as well. Hank did a good job on his park. Desmond on a green slide at the park. 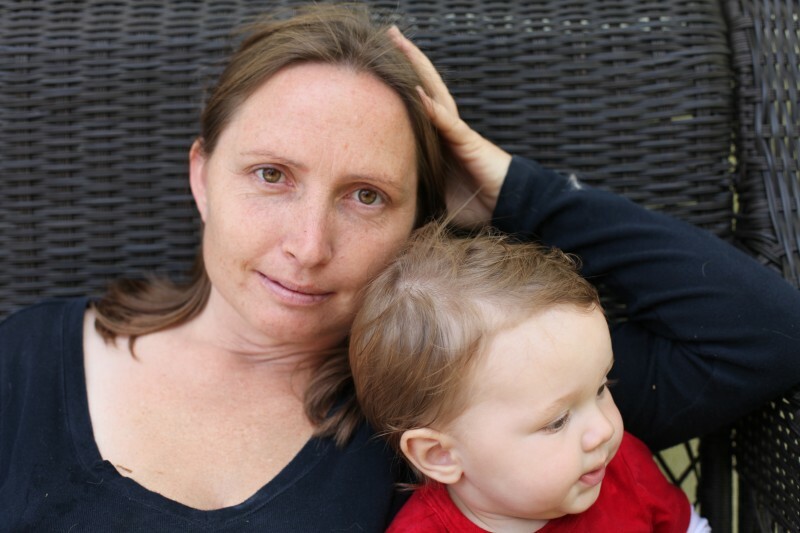 Mia turned six last month, and I took the day off to spend with her, we had a great time. 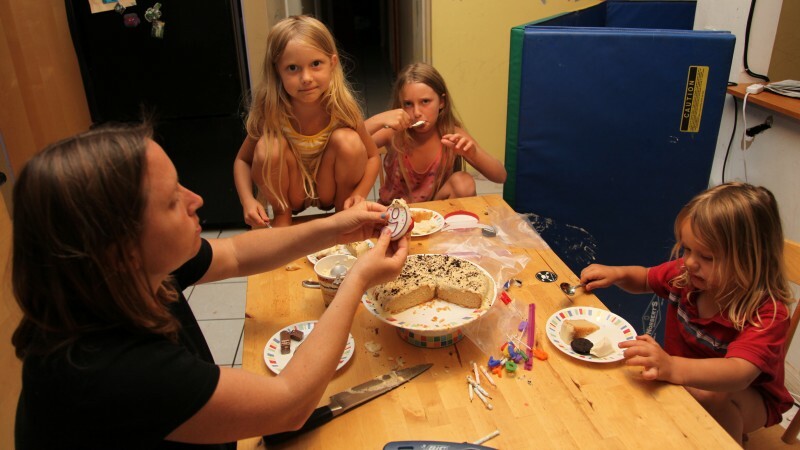 And of course there was cake and ice cream! 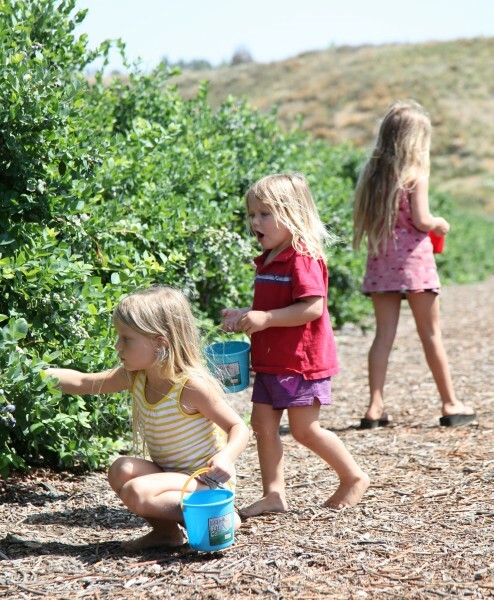 For Mia's birthday we went to Temecula and went blueberry picking at the Temecula Berry Company. It was like heaven, since I love blueberries. 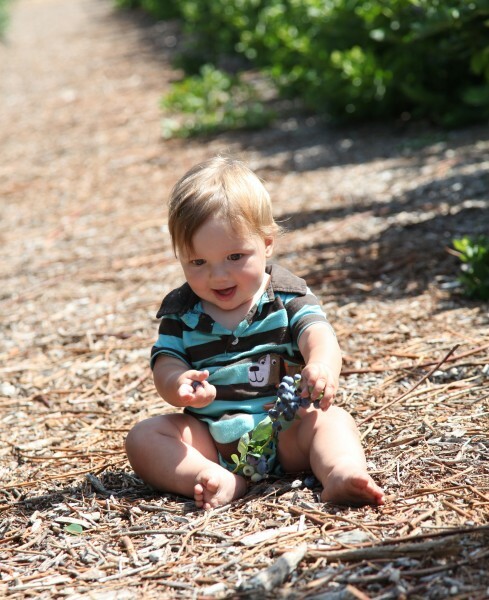 Miles was having a great time, we set him up with some blueberries and he went to work. 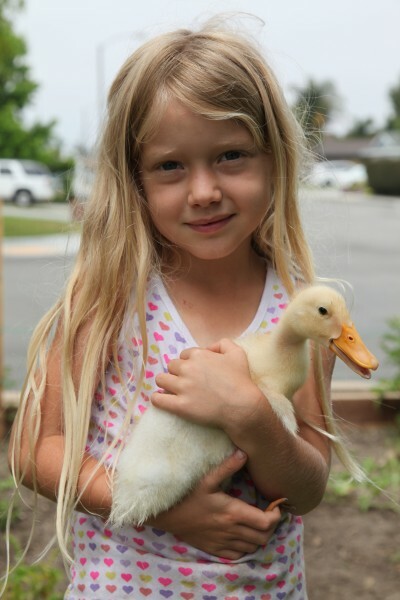 We bought three new ducklings for Mia's birthday. 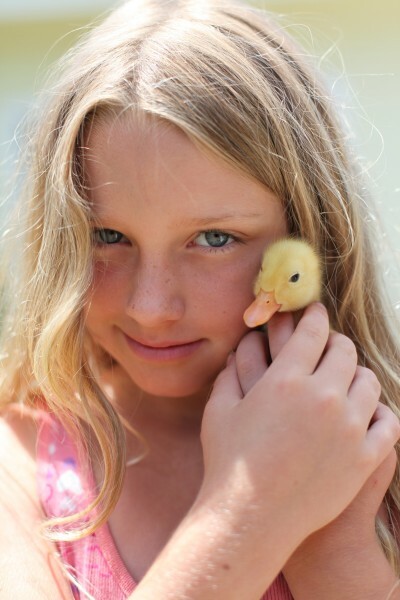 They're Pekin ducks, and I have to say, ducklings are crazy cute. They bond to you and follow you around wherever you go. Watching ducklings following the kids is really cute. 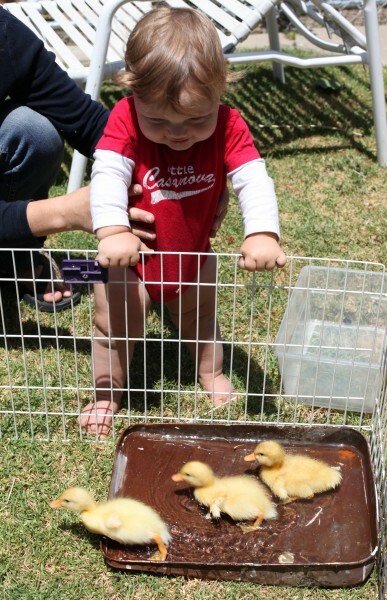 Miles did not get to hold the ducklings, but Desmond was old enough to hold them. Naomi read on the internet about using a paint-roller bucket to let them go in the water without getting stuck. It worked great. 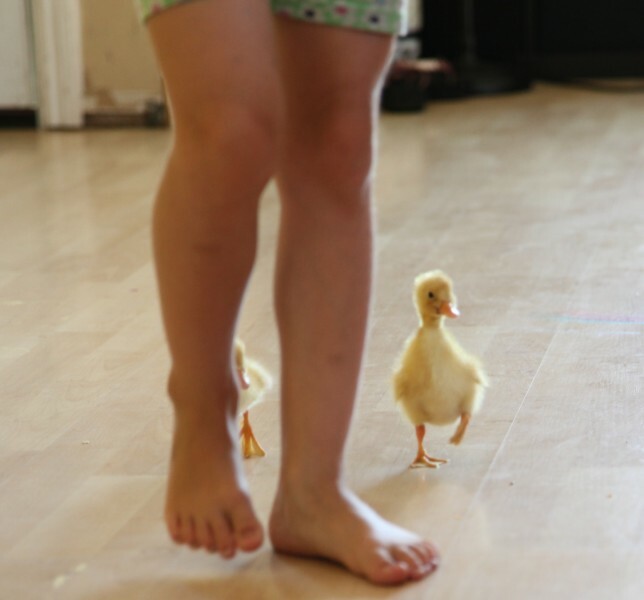 The ducklings and Miles got along great. 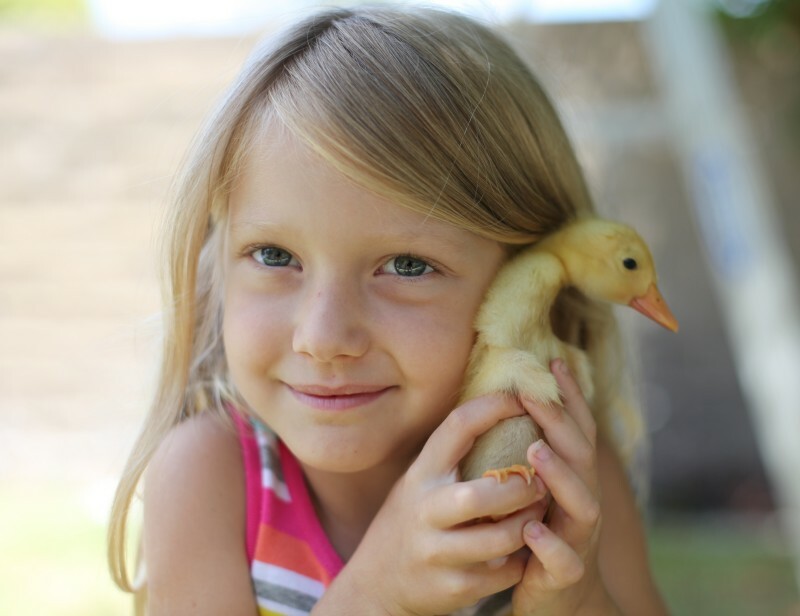 These ducks grow really fast. This is after about three or four weeks. They're really big now! Naomi and Miles. I liked this picture a lot. Desmond isn't the only one interested in skateboards. 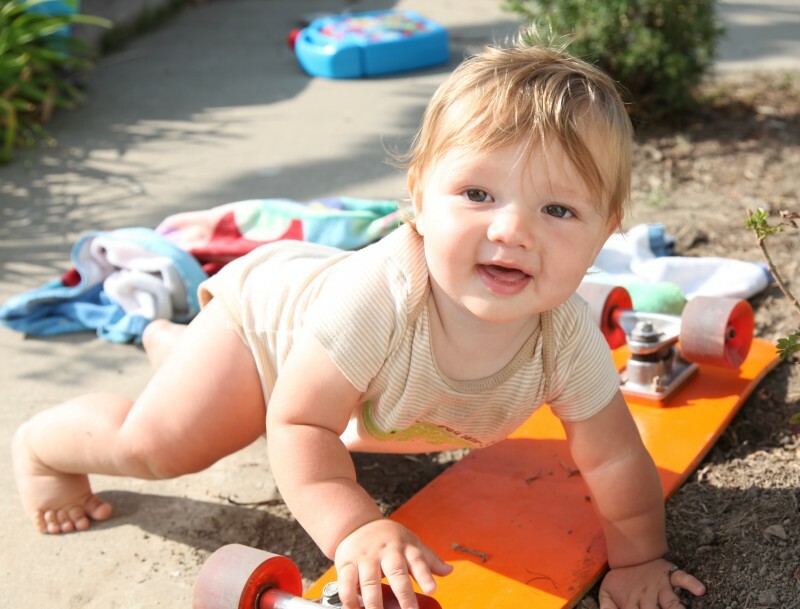 Desmond can stand up and ride his skateboard, btw. I'll have to post a video of this next month. He even does tricks like jumping off it while it's moving. 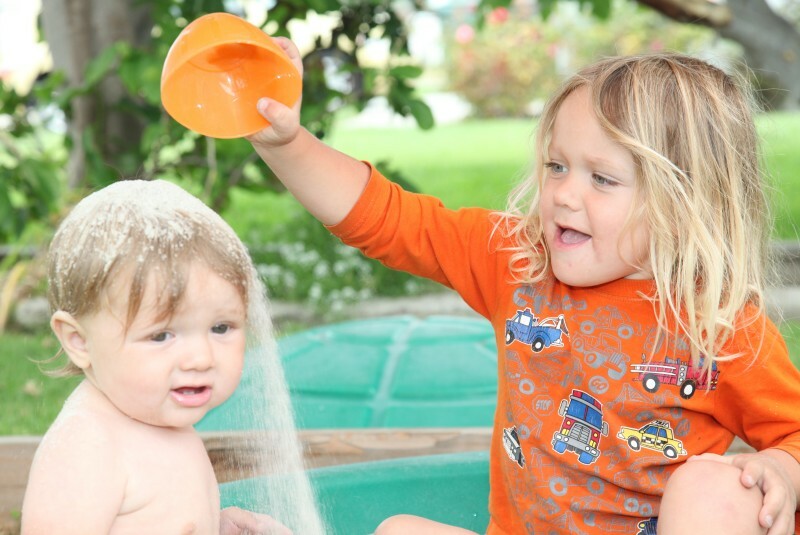 Hey, what are big brothers for, if not to pour sand on your head? Not that Miles needs any help getting dirty. This is actually an Acai bowl, even though it looks suspiciously like mud. 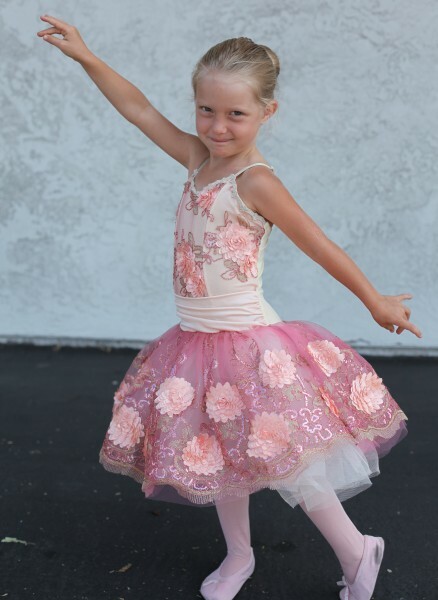 The girls have been taking ballet, and they had a show at the end of the class. 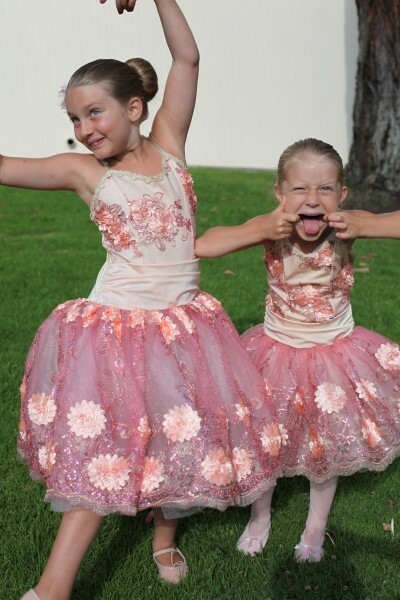 Amelie and Mia looked so amazing all dressed up, it was a lot of fun. Mia giving us her best ballet pose. Of course, some requests for a nice pose don't go so hot. I recorded their recital, then sync'd a clean copy of the music to the video, and it came out great. I also created a couple of videos where I zoom in on Mia and Amelie. 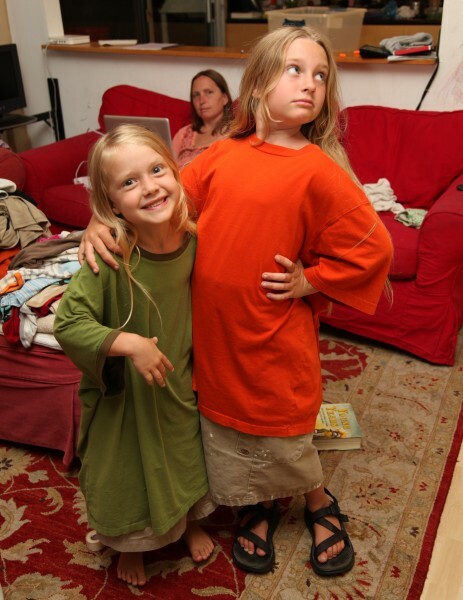 One night the girls wanted to dress up like dad. Their imitation of me is spot-on. We celebrated Summer Solstice this year, it was pretty neat. It's nice to recognize the changing of the year, plus, there's fire! 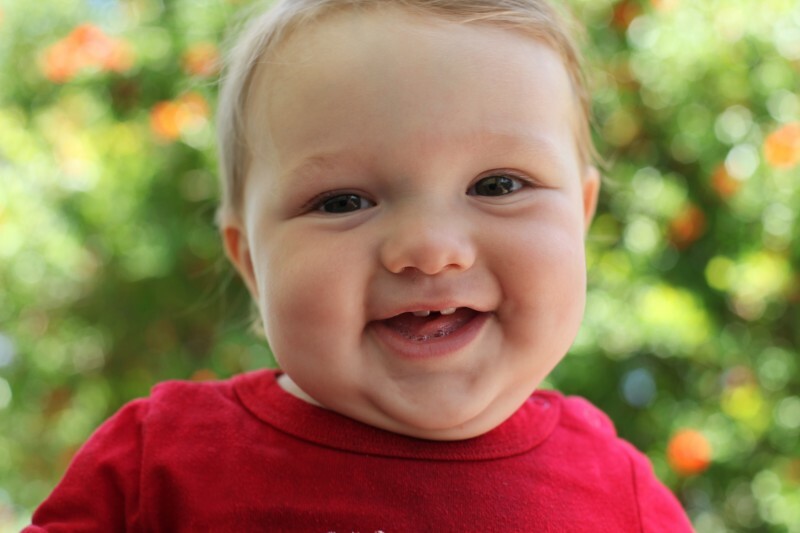 Until next month, stay happy you fat little baby!